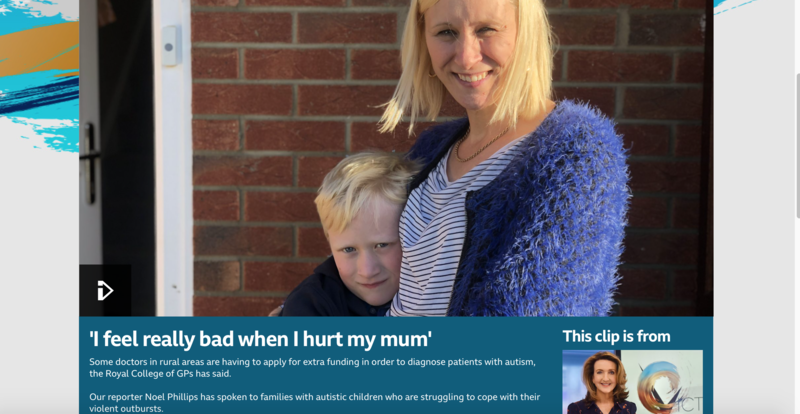 The programme explored problems parents have in obtaining a diagnosis of autism / PDA and then the appalling lack of support following a diagnosis. As a result of a lack of help for families, parents may be coping alone with extreme levels of violence on a daily basis, as children ‘meltdown’ when dealing with anxiety of stress. Children may be excluded from school because of their behaviour, further increasing their vulnerability. We are warned that without timely assistance, many young people are on a trajectory to prison. Parent, Jason Goldsmith spoke of he and his wife being accused of abusing their 13 year old son by Children’s Services after trying to restrain him, and then going on to install CCTV in the home to provide evidence of the violent behaviour and abuse their son was using against them and his younger sister. They were eventually able to obtain help following this. This is not a new issue, but we are reminded that as recently as 40 years ago there was almost no understanding of autism at all; and certainly PDA remains little understood, and often undiagnosed. Member of parliament Anne-Marie Trevelyan, who was present in the studio as a parent of a child with autism, expanded on the importance of the Autism Act 2009, which has meant that there is greater awareness; and the government is to make mandatory, in 2019, training in the understanding of autism for all in the public services. Nevertheless, as was pointed out by another parent present, awareness is of little help if there is no support accompanying it. Each time I hear the testimony of parents I am overwhelmed with the enormity of what people are dealing with on a daily basis, and often ‘out of sight’ from the majority of the population, who see simply ‘bad behaviour’. Yet there is a sense of gathering momentum as programmes such as this work to bring attention to the issues. Awareness IS increasing. Therapies and support ARE being slowly developed and implemented. Without support, families fear for the mental and physical health of all concerned, and for the future prospects of their children. As a society we cannot continue to abandon so many people. funny how social services have the money to hire expensive agency workers because they can no longer stand working for social services local authority and get better pay, they also have the money to employ a foster carer yet take kids away from parents who just need a bit of respite. Social services have a legal duty to provide services so fight them all the way to the end to get the care you need to be funded..
Hi Helen, thank you for taking the time to comment. As a social worker myself, I will agree that there are real issues about both capacity and understanding in some areas. It is a tragedy for all concerned when this means that we do not see the best possible help for families. I hope that we can start to make a change, even if it is slow. Are you able to give any more information about the therapies and support that are being developed and may be available? I think a big part of the problem is that no-one has any workable strategies to suggest to parents in this situation. The article mentions support from a DV organisation – is that the most likely source of support? Children’s Services seem to be at a loss. The sense is that we need to develop a collaborative approach, so that all practitioners, whether based in social care, health, education, police, voluntary groups …. are aware of the issues and the sort of help that might be needed, and can offer this together. That way it will not matter who a parent approaches in the first instance as all will know how to respond. I have found that there is rarely one thing involved and so support and change needs to recognise this. At the moment we are some way away, and although knowledge is growing, the best response may be from a different agency in each area. I will emphasise that it is important to look at the situation in the round. If a child has an autism diagnosis – for instance – it will be extremely helpful and important to have input as to ways to help with regulation and understanding behaviour. If there has been past domestic violence, then there are programmes offered that help parents and children ‘recover’. If there has been past trauma or there are other vulnerabilities outside of the home, then it is important that these are identified and the family as a whole has an opportunity to find appropriate support. That is just a few examples and often there will be more than one issue. There are some specific programmes that are being offered, and approaches such as NVR that have been widely acclaimed as offering at least a way of bringing down the temperature so that other things can be addressed more easily. The exact type of programme offered – and how to access it will depend on where you live. There is more information about some of these on other pages of my site. I am aware that in many parts of the country the response from Childrens Social Care has been a difficult one, with a focus on protecting children from harm directed by adults meaning that this has not always attracted the attention and response needed. I do know though that there is excellent work taking place within social care in many parts of the country, and hopefully we will see improvements over time.